(CNN) -- Moldova's president Wednesday accused Romania of involvement in a huge anti-communist protest, much of it coordinated on Facebook and Twitter, which saw government buildings ransacked and police arrest scores of demonstrators. Protests over Moldova's election have gathered pace, fueled by Facebook and Twitter. Vladimir Voronin described riots in the Moldovan capital Chisinau against his ruling Communist party's victory in Sunday elections as "very serious" and pledged to take action in response. "Romania is involved in everything that has happened," he said, according to the RIA-Novosti news agency. "Patience also has its limits." An estimated 10,000 mainly students gathered Tuesday to protest what they say was a rigged election. Many in the crowd were summoned using social networking tools, particularly Twitter. IReport: Send your photos and emails. Demonstrators claim Voronin's ruling Communist Party manipulated Sunday's election results to make it appear that it had won 50 percent of the vote, a majority that would allow the party to and amend the Constitution to allow Voronin to rule for a third term. Although election observers from the Organization for Security and Cooperation in Europe found the voting largely free, many in the former Soviet state disagreed. "There were too many frauds," said Alina Radu, director of the weekly newspaper Ziarul de Garda. Her newspaper's Web site asked readers Wednesday morning to send in instances of voter abuse. "In just half an hour, we had tens and hundreds of cases," Radu said. Voronin said he was expelling the Romanian ambassador to Moldova and imposing visa restrictions on Romanians in response to the violence, RIA-Novosti said. The agency reported that Romania has denied involvement and was threatening retaliatory measures. Analysts saw Tuesday's demonstrations as a student-led action that "caught the opposition political leaders by surprise." "Because I think that after talking to the Western observers, they didn't expect they would get any support for protests," said Tammy Lynch, senior fellow at Boston University's Institute for the Study of Conflict, Ideology and Policy. "It seemed to be undirected," Lynch said. "A lot of students felt angry they were being ignored and took out their anger on buildings." Moldova's ties with Romania have become increasingly strained under Voronin, who has steered his country diplomatically closer to Russia since taking power in 2005. 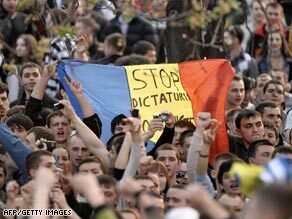 The president has repeatedly accused Romania of wanting to absorb his country.